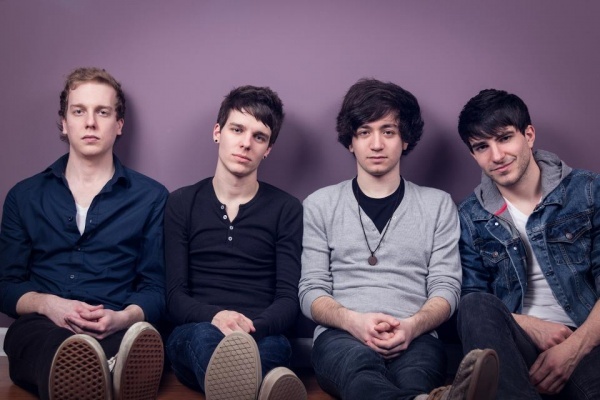 Automatic Habit, a four-piece pop rock/pop punk band hailing from Philadelphia, is set to grace Penn State with their presence this Saturday, March 23rd at this year’s Movin’ On Battle Of The Bands. Automatic Habit consists of Bill Alexander (Bass),Johnny Costa (Vocals), Bruce Wiegner (Guitar/Vocals), and Joey Wooliver (Drums). Bill currently attends Penn State Abington allowing Automatic Habit eligibility to compete in this year’s Battle for an opening spot at this year’s Movin’ On festival featuring MGMT, Brand New, Gloriana, Big Boi, and Kids These Days. The guys have all been friends for a while, performing in separate bands from the Philadelphia area with the exception of Joey, who moved from Tennessee to Philly to play in the band. Naturally from being friends for so long, their chemistry on stage comes so easy to them. Their personality truly shines when they perform and it says a lot about them as artists as well as their music. Automatic Habit has been performing together since 2012 and have been taking the Philadelphia local music scene by storm. Since the start of the band, they have worked tirelessly to take this band to another level. They have released two singles on their Bandcamp (automatichabit.bandcamp.com), and a Christmas song which was released on Alternative Press Magazine. Over Spring Break, the band traveled to New York to begin recording their debut EP with John Naclerio at Nada Recording Studios, the same producer that recorded My Chemical Romance, Brand New, and Senses Fail. In April, the band plans on recording vocals with Ace Enders (of The Early November). Their influences include Fall Out Boy, Hit The Lights, Paramore, and many more. On a more personal note, Automatic Habit are my best friends from home and I could not be more proud of them and all their success thus far. I’ve written about Automatic Habit many times before on State In The Real and I’m so beyond stoked to finally bring the band to Penn State. Movin’ On 2013, State In The Real, and Penn State are so excited to have Automatic Habit compete in this year’s Movin’ On Battle Of The Bands and we hope you are too! Check out below two of the band’s singles titled “Play It Again” and “This Is Misery” and let us know what you think! Come out Saturday, March 23rd at 9pm in Alumni Hall to hang out with me and the guys of Automatic Habit and catch their set!